Jessica Vaughan, the director of policy studies at the Center for Immigration Studies, reported that in the last 10 years half the 10.6 million immigrants allowed into the country were "initiating" and the rest sponsored followers. Over the last 35 years, over 60 percent were sponsored. Her findings are even more alarming when considering the fate of some 800,000 recipients of the Obama-era Deferred Action for Childhood Arrivals. "Deferred Action for Childhood Arrivals (DACA) program is likely to increase chain migration in the future, as DACA beneficiaries eventually qualify for citizenship and the opportunity to sponsor their parents and siblings, many of whom also have been residing in the United States illegally," she wrote in the report. Over the last 35 years, chain migration has greatly exceeded new immigration. Out of 33 million immigrants admitted to the United States from 1981 to 2016, about 20 million were chain migration immigrants (61 percent). Judging from preliminary administrative data, approximately 1,125,000 legal immigrants were approved for admission in 2016, which is about 7 percent higher than 2015, and one of the highest numbers in the last decade. The largest categories of chain migration are spouses and parents of naturalized U.S. citizens because admissions in these categories are unlimited by law. According to the most complete contemporary academic studies on chain migration, in recent years each new immigrant sponsored an average of 3.45 additional immigrants. 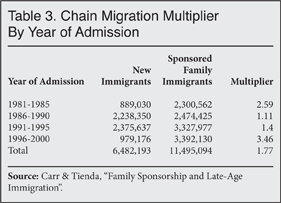 In the early 1980s, the chain migration multiplier was 2.59, or more than 30 percent lower. Of the top immigrant-sending countries, Mexico has the highest rate of chain migration. In the most recent five-year cohort of immigrants studied (1996-2000), each new Mexican immigrant sponsored 6.38 additional legal immigrants. Chain migration is contributing to the aging of the immigration stream. In the early 1980s, only about 17 percent of family migrants were age 50 or over. In recent years, about 21 percent of family migrants were age 50 or older — a rate that is more than 24 percent higher. This trend has implications for the fiscal consequences of immigration. Enacting an amnesty for roughly 700,000 DACA beneficiaries is likely to add double that number in additional immigrants because of chain migration, as the amnesty beneficiaries sponsor their parents and other family members.